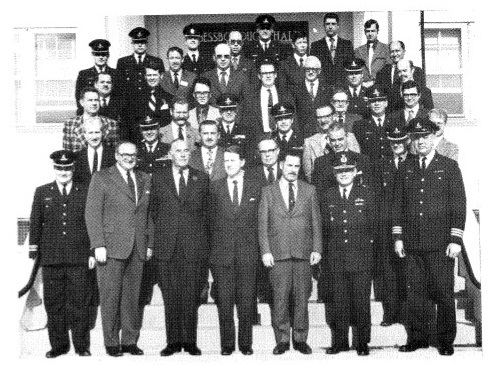 The 1975 annual meeting of the RCAA was held at CFB Valcartier during 25 to 27 September. It marked the Association’s first meeting at Valcartier, and LCol Pete Bouvette and his officers ensured that our stay was indeed memorable. We were most fortunate in having an excellent representation of regular force gunners. These included: Cols Cotter, Calnan, Wellsman, Doucet and Beudry; LCols Ward, Hurley, Stothers and Bouvette; Majs Thompson, Kennedy and Greenizan. BGen Heitshu and Maj Walton were unfortunately hung up at the last minute and therefore unable to join us. Those present, however, took very active and constructive roles in all the proceedings. The magnus opus of the meeting was the production of a very timely and serious position paper. This paper was forwarded immediately following the meeting to the office of the Prime Minister, the MND, the CDS and all members of the Commons Committee on defence. For the benefit of those gunners who are not in receipt of the RCAA Annual Report, but who do receive the Canadian Gunner, we are pleased to publish that paper here for you. “The essence of this argument is that Canada, after a prolonged erosion of its ground combat forces, is in danger. Ground combat forces stand as the ultimate guarantee of our nation’s sovereignty and, indeed, of our national integrity: to honour our international commitments, to guarantee the life and property of our citizens, to ensure that public order is maintained, and to safeguard the liberties inherent in our democratic process. Canada spends almost three billion dollars on defence; and yet would be hard-pressed to find 13,000 fighting troops to answer an emergency. In 1965 we had 25,000 trained combat soldiers; today we have 13,000. In 1965 there were 38,000 civilian employees of the Department of National defence; today there are 34,000. In ten years our combat capability has declined by almost fifty per cent. We have too much tail and too few teeth. What, then, is the answer? Either the Defence budget must be sharply increased or existing resources better applied. There is a solution. We urge that the priorities of National defence be reassessed and resources reapplied to expand our ground combat forces – regular and reserve. The meeting closed in the customary manner with a mess dinner on Friday evening, followed by the presentation of Competition awards. MGen Sparling, the past Colonel Commandant, was happily in attendance as a guest of the RCAA. Col Sherwin presented MGen Sparling a framed print entitled “A Hot Night in the Batteries” as a token of gratitude for all the support he had rendered the RCAA during his term as Colonel commandant. LCol Brian S. MacDonald took the Chair as president for the coming year, and in this capacity he will guide the RCAA through its centennial year. 1647 Belcourt Blvd, Orleans, Ontario, K1C 1M3.